Getting your daily boost of greens has never been easier. Infused with over 2,800 mg of alkalizing green superfoods, Zupafood™ GREENZ works to support your body’s natural detox process, improve digestion and boost energy levels. Harnessing the powerful benefits of organic spirulina, wheatgrass, kiwifruit and chlorella, and flavoured with delicious natural mango extract, this refreshing tonic is a nourishing pick-me-up. Zupafood™ GREENZ is the culmination of years of research and formulation, designed to help your body maintain good nutrition and a natural pH balance. Made with the same top quality ingredients that define all our products, this all natural powder is a rich source of vitamins, minerals, enzymes, phytonutrients and chlorophyll. Easily absorbed and all natural, Zupafood™ GREENZ provides all the nutrients you need to optimize the function of your body’s natural systems. Every day our bodies are constantly at work to maintain a healthy alkaline zone. We can help this natural process by increasing our intake of green vegetables, but this isn’t always enough to neutralize the array of acidic foods we consume. Zupafood™ GREENZ has been carefully tailored to do the hard work for you, providing much-needed support for your body in one easy hit. Its concentrated formula captures the intense power of green superfoods, aiding the function of all 11 of your body’s systems – digestive, endocrine (hormonal), integumentary (hair, skin & nails), circulatory and nervous system to name a few! How does Zupafood™ GREENZ work? Zupafood™ GREENZ combines a powerful combination of natural ingredients to restore your balance from the inside out. Zupafood™ GREENZ contains 75 mg of high quality green tea extract. That’s just enough caffeine for a mild buzz without the “jittery” effect of coffee. Green tea extract also contains L-theanine, an amino acid that helps improve mood. Studies show that caffeine and L-theanine work together to stimulate brain activity, helping you stay mentally and physically focused. Improved digestion can have a huge impact on your daily life. Our unique formula harnesses the power of Chlorella powder and Kiwifruit extract to support your natural digestive function and waste management processes. These powerful ingredients contain highly concentrated actives which help promote healthy gut flora, increasing energy levels and leaving you feeling awake and alert. A strong immune system is key to year-round health. Our superfood powder wouldn’t be complete without the incredible benefits of organic Wheatgrass and Spirulina to support immunity. Wheatgrass works to support your body’s natural defences, balance blood sugar and help maintain liver health and function, while Spirulina is known to support a healthy immune system. When your body tries to achieve alkaline pH levels it will often leech calcium from your bones. Zupafood™ GREENZ helps to prevent this process by providing an abundance of balancing greens. It provides 500 mg of calcium in every serve – giving you the same benefit as eating an entire cup of raw spinach! When your body is functioning within an optimal pH range, you’ll discover a huge range of benefits including healthier hair and skin, natural weight management improved sleep patterns. … And for your taste enjoyment! Zupafood™ GREENZ superfood powder is sweetened with stevia and flavored with 100% real green mango – free from all artificial additives or flavorings. Simply mix with water or your favorite beverage and enjoy a refreshing tonic that is as delicious as it is natural. Other ingredients: Natural Mango Flavor, Citric Acid (Preservative), Malic Acid, Stevia Glycosides. Does not contain soy, peanut, shellfish, gluten or dairy. Dosage: Adults – take at least one packet per day. If desired it is perfectly fine to have 2 - 3 packets per day of any one or a combination of our Zupafood products. Add the contents of one packet into the Zupafood shaker. Add water, juice or your favorite beverage and shake vigorously. Drink immediately while the ingredients are in suspension. Cold or warm water is fine, but do not use hot water as it can cause the ingredients to come out of suspension. 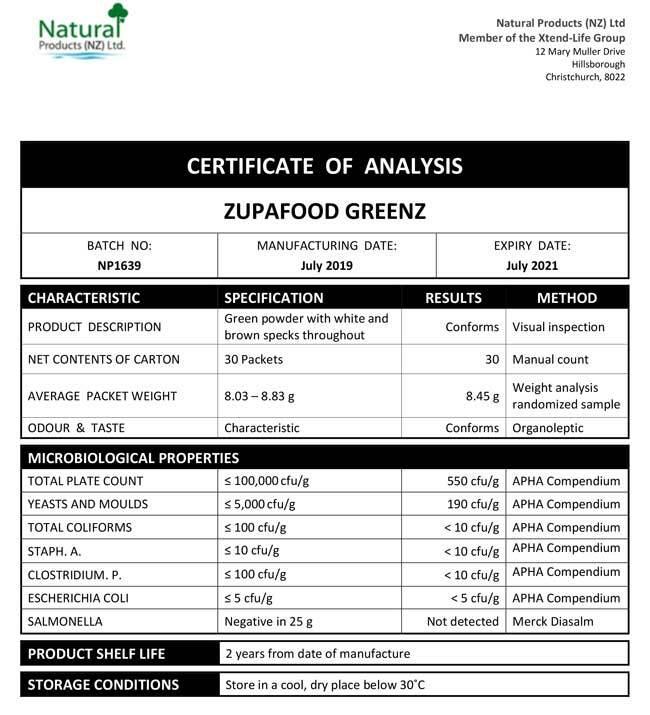 Please view our Zupafood GREENZ Certificate of Analysis (CoA) below. We produce all of our products regularly throughout the year. You can be assured that every packet, from every batch will meet these exceptional standards. What are the differences between the three Zupafood™ products? All Zupafood products contain the special Xtend-Life 'Superfood' blend made up of organic fruit extracts, green tea extract and marine calcium. Zupafood GREENZ contains additional organic greens to support digestive health and gently detoxify the body. Zupafood for SKIN contains marine sourced collagen to nourish skin from within. Zupafood ELITE contains the largest array of ingredients with the superfood base blend, organic greens and marine sourced collagen as well as high potency medicinal mushrooms to support energy levels, cardiovascular health, immunity, the libido and to help fight the signs of aging. What’s the difference between Chlorella and Spirulina? Chlorella and Spirulina are both extremely nutrient dense, fresh-water foods. Spirulina, a blue-green color, is famed for being rich in protein (up to 70%!) and is the only plant food source to offer vitamin B12. Chlorella is a brighter green and is known for having the most chlorophyll of any known plant. Both of these incredible superfoods contain a powerhouse of amino acids, vitamins and minerals – which is why we’ve included both of them in Zupafood GREENZ. Is Zupafood™ a meal replacement? No. Some people may mix it with a smoothie and consider this a 'meal', however it is not designed to offer all the nutrients required as part of a balanced meal. Can my child use Zupafood™ GREENZ? Zupafood GREENZ is suitable for children from 6 years old. As many children struggle to eat leafy green vegetables, Zupafood GREENZ is a great way to 'top-up' their intake of greens every day. Can Zupafood™ be taken together with other Xtend-Life products? Yes, Zupafood is perfectly safe to be taken at the same time as any of the other Xtend-Life products. Can I use more than one Zupafood™ version at the same time? Absolutely. For example, you may wish to take GREENZ to support your detoxification and digestion, plus SKIN to support your skin health as well. There is no risk of taking too much of any one ingredient in the Zupafood products. Should I stop taking Total Balance or Multi-Xtra if I am going to start using Zupafood™? Although Zupafood is packed with nourishing ingredients, it does not contain the complete array of vitamins and minerals you require from your diet. For this reason we encourage you to keep using Total Balance or Multi-Xtra at the same time as Zupafood. Can you overdose on the ingredients in Zupafood™? No, there is no need to feel concerned about taking too much of the ingredients in Zupafood. Is Zupafood a better choice than Total Balance to provide the ultimate array of ingredients and support for overall health? Total Balance, as part of our Core Wellness Activators, is the best product available for maintaining overall health. It contains 98 potent vitamins, minerals, enzymes, amino acids and micro nutrients and offers gender specific versions for targeted health benefits. However, Zupafood is ideal for people who have trouble digesting or absorbing supplements in tablet form. Zupafood also creates an energizing effect and offers a refreshing way to take in an abundance of nutrients. If my Zupafood™ has gone hard in the packet is it still okay to consume? Yes, it is still fine to consume Zupafood powder even if it has slightly hardened. The efficacy of the product is not affected. Gently shaking or breaking up the contents will allow you to prepare the powder as normal. Is Zupafood™ a good option for people that have difficulty in swallowing tablets, such as the elderly? Zupafood is perfect for those who have trouble with tablets. Zupafood is especially ideal for elderly people as their appetite and digestive function may begin to wane, making it harder for them to obtain sufficient nutrients through the diet alone.